Cpl. Joshua Sheets began riding motorcycles at the age of 9. Cpl. Sheets began his law enforcement career in 2007 with the Winston Salem Police Department. In 2010 Cpl. 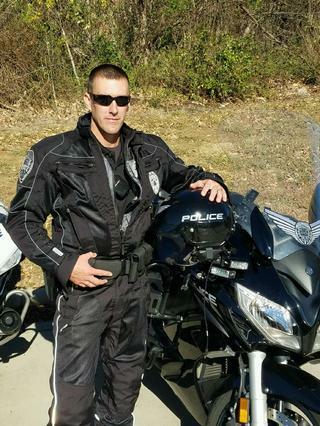 Sheets joined the WSPD Motor Unit and began his riding career on a 2005 BMW 1150RT Police Motorcycle. Cpl. Sheets has attended the Basic Police Motorcycle School hosted by GTCC as well as an 80 hour Police Motorcycle School hosted by the NC Highway Patrol. In November of 2016 Cpl. Sheets attended the IPTM Police Motorcycle Instructor School and Cpl. Sheets currently rides a Police Yamaha FJR1300. Return to Winston-Salem Police Dept.